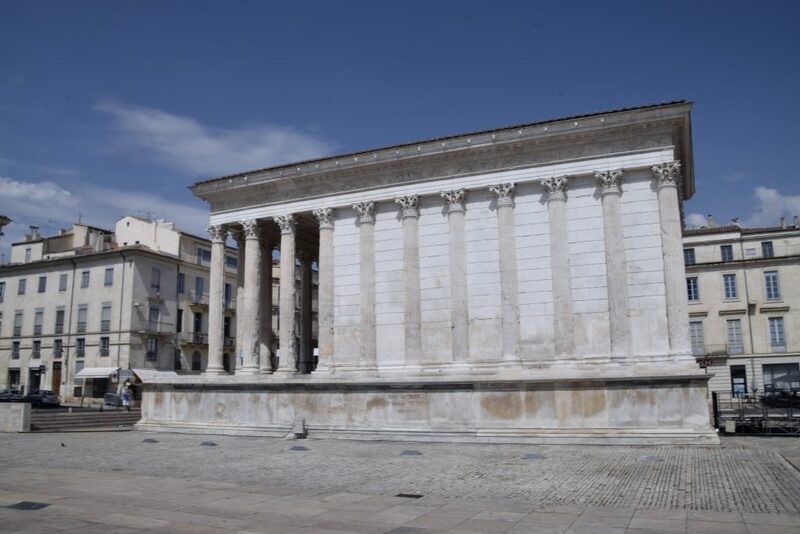 Nîmes is a very elegant, confident little French town – probably the classiest that I visited on my summer trip. It has a great ‘French’ feeling, with higgledy-piggledy roads, each as charming as the last, and each pulling you in to be explored. The problem was that it was very hot when we visited, and I’m not very keen to explore in the heat. I want to sit in a fountain and die. Unfortunately I wasn’t allowed to do that, and I did in fact doggedly walk around town, determined to enjoy it. The fact that I did enjoy it despite myself is a testament to the charm of the town. 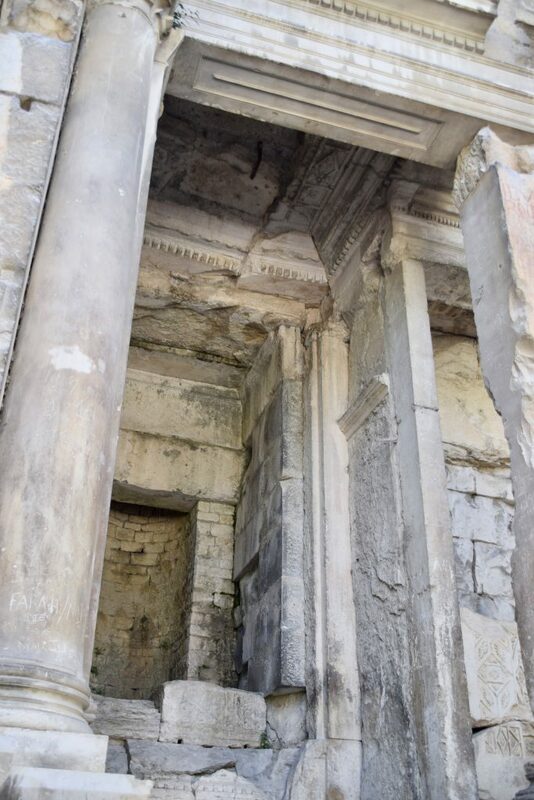 Th first traces of human habitation in Nîmes are from the end of the 6th century BC. 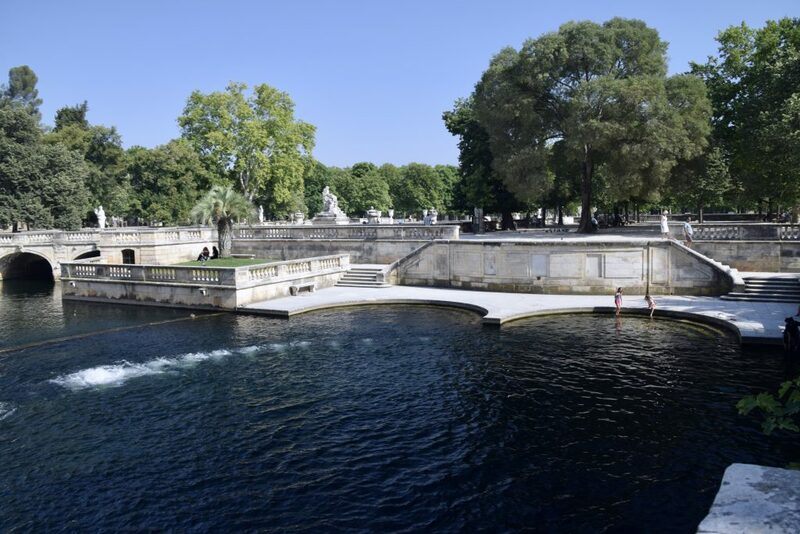 They were located close to the sacred spring dedicated to Nemausus – the current site of the Jardin de la Fontaine, about which there will be more later. 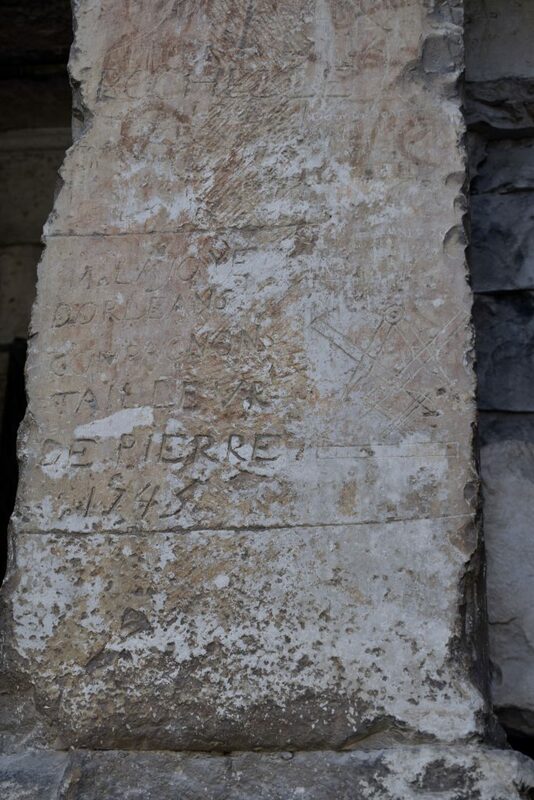 The Celts who lived in the area gradually benefited from trade that was centred on the Greek colony of Massalia (modern Marseille), something that’s well demonstrated by the local finds on display in the Roman museum, Musée de la Romanité, which has inscriptions in the Celtic language, written in Greek letters. The Romans came along and between 125-118 BC took over much of the area between the Alps and the Pyrenees, creating the province of Gallia Narbonensis. 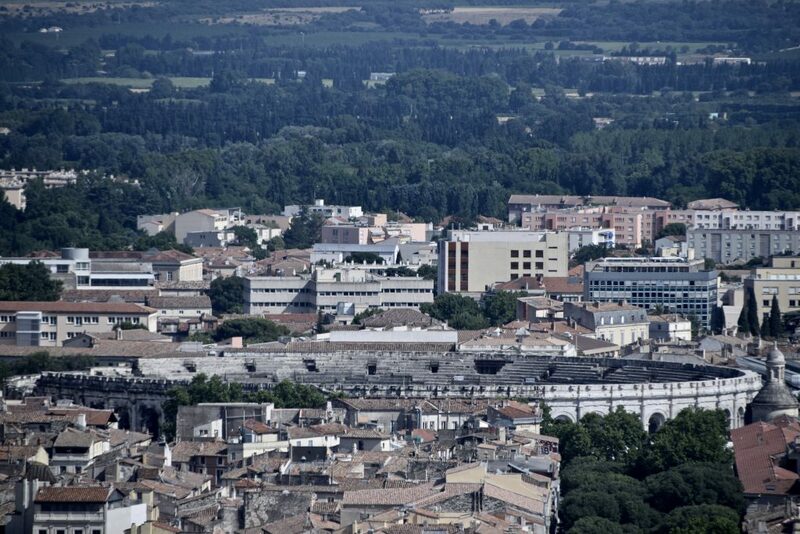 Nîmes got its name from Nemausus, the Gallic god whose cult was related to the sacred springs. If you walk from the train station towards town, the first major monument you’ll see is the Pradier Fountain. I think they’ve re-landscaped the area quite recently, because it all looks lush and modern. 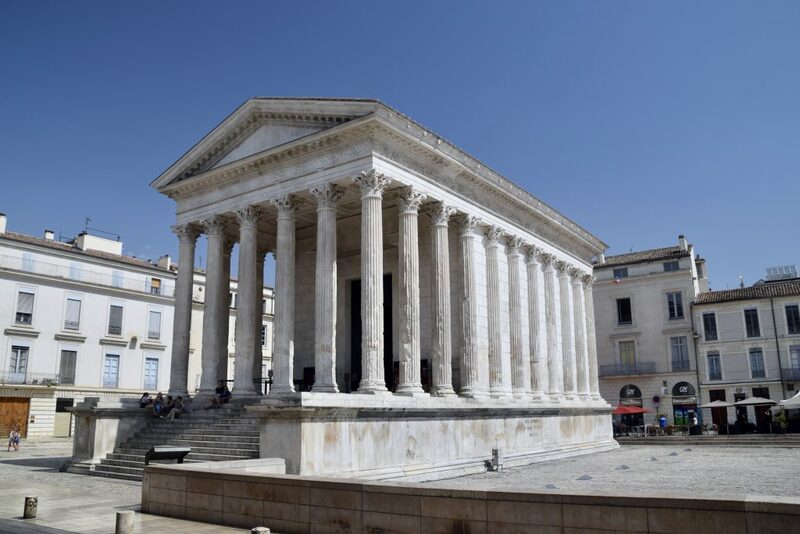 The statue, depicting the city of Nîmes, with a crown replicating the Maison Carrée, was made by the Genevan James Pradier in 1850. It’s the perfect way to start a tour of the town. From the fountain, you can see the Roman Amphitheatre peering round the trees. It is a splendid monument and shows off the amazingness of Roman architecture. It’s a compact building, and you can go inside – but in some ways the outside is more striking. If you’d like to see some more about it, please click here. If you’d like to see more about the museum, please click here. 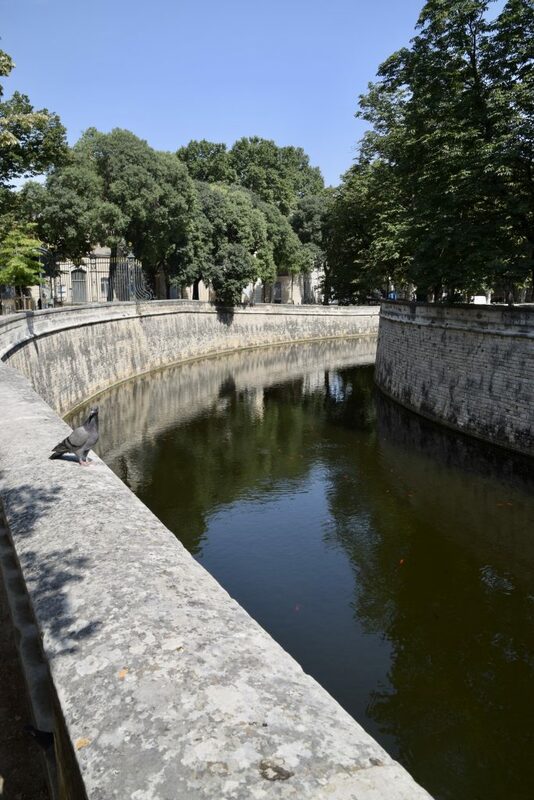 One of the most iconic buildings of Roman France is without doubt the beautiful Maison Carrée. It has been somewhere I’ve been desperate to visit since I first saw a picture almost twenty years ago. 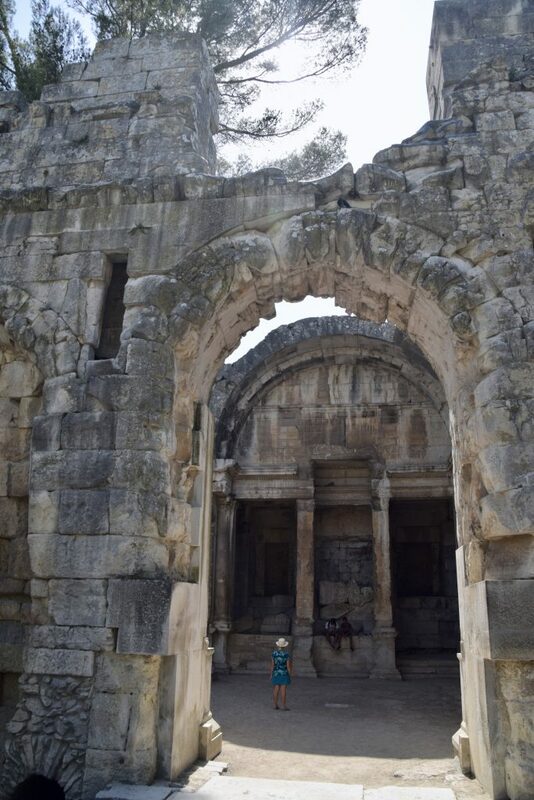 It was constructed in 2/3AD as a part of mass building project which the Roman Emperor Augustus launched on the city. 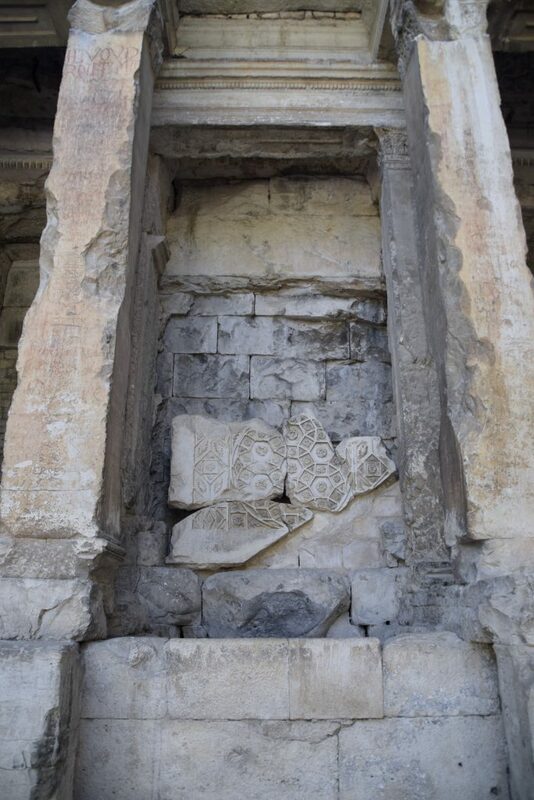 The temple was dedicated to his grandsons, Gaius and Lucius, who Augustus adopted and promoted as eagerly as if they were his actual children, for he intended one or the other to succeed him in his newly created ruling dynasty. Within two years of the temple’s construction, both boys were dead, and Augustus had to make other plans. Still, that’s another story. One of the reasons why the building has stayed in such good shape is because it has been continuously used. 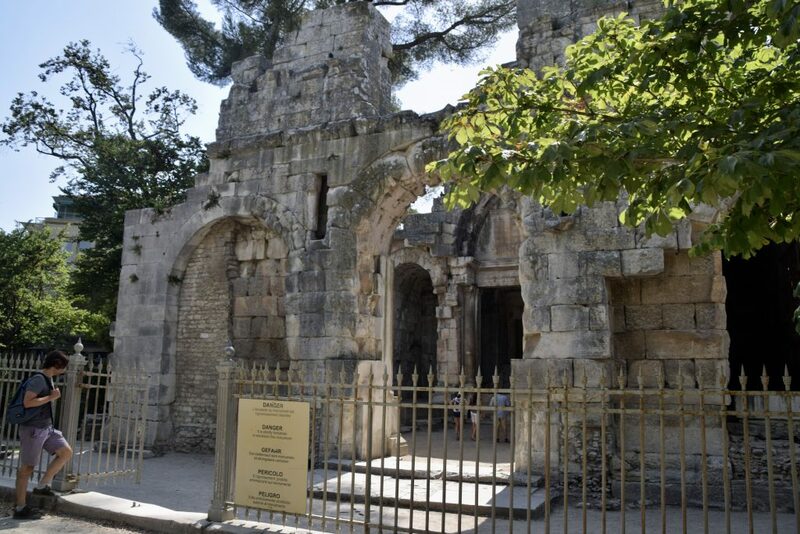 After the Romans, it became the seat of the judiciary, and from the 11th century it served as a Town Hall. It then fell into private hands, when it was turned it into a dwelling-house, then, rather shockingly, a stable. The Augustinian monks rescued it in 1670, restoring it and fitting it out as a church. With the Revolution in 1789 the building became state property and was used for dull purposes until it was finally made into a museum in 1823. It was named the ‘Musée Marie-Thérèse’, after the daughter of Louis XVI. 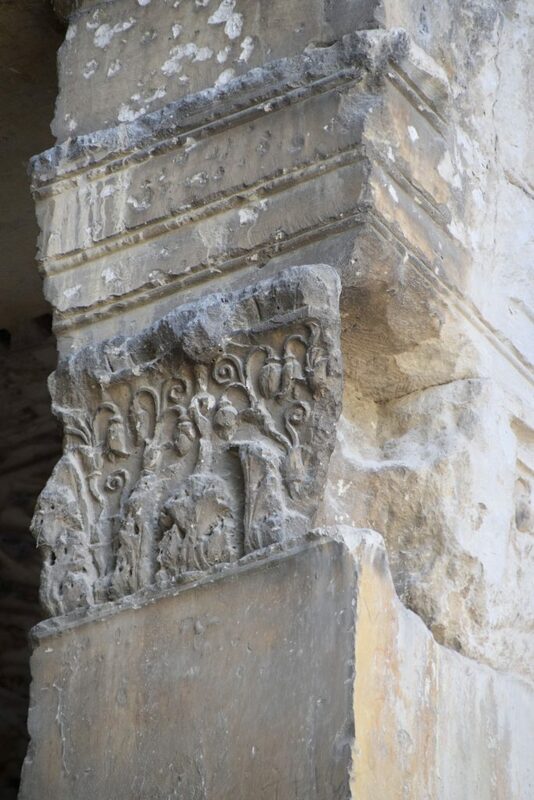 The Maison Carrée still contained Roman artefacts until the new museum opened, and now it just shows a film on Roman Nîmes (which you have to pay for), which is a total waste. Since we would have had to wait for over an hour to see it, we gave it a skip. There is nothing to see inside, apparently, but it would still be rather a unique opportunity if we were allowed to go in there and experience being inside a Roman temple. In fact, I’m surprised that since the museum claims to only have a fraction of its collection on display, that they aren’t using this extraordinary building in a more meaningful way. Hopefully the authorities will come to their senses and use this wonderful building as something more than a history-themed cinema. As it is, we walked there, walked round it, marvelled at its proportions and went on our way. 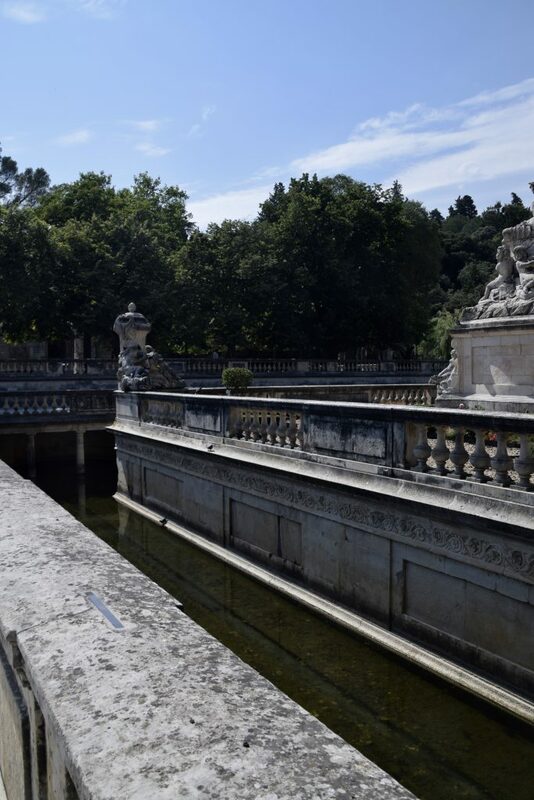 The amazing gardens which surround the significant fountains are the result of 18th century aggrandisement. 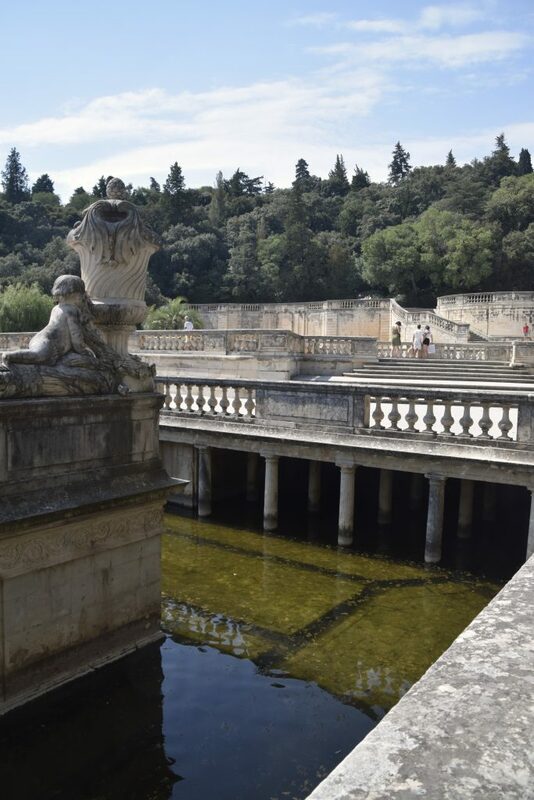 The city needed to collect rainwater and in the process of building a reservoir, large amounts of Roman remains were discovered. They were on the site of a Celtic site dedicated to Nemausus, which was then rebuilt as a temple to Augustus by the Romans. Although certain original elements were incorporated into the new fountains by JP Mareschal, he did basically destroy the original site. It is a genuinely lovely place, being as it is, from the 1740s, but you can’t help but regret quite recent vandalism. Yes, I see the 18th century as recent. 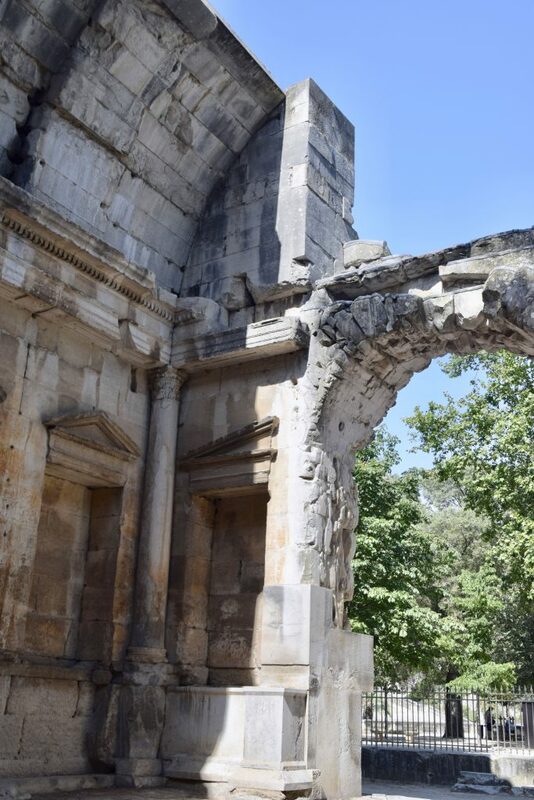 The attractive, picturesque remains of the so-called Temple of Diana are on the edge of the gardens. 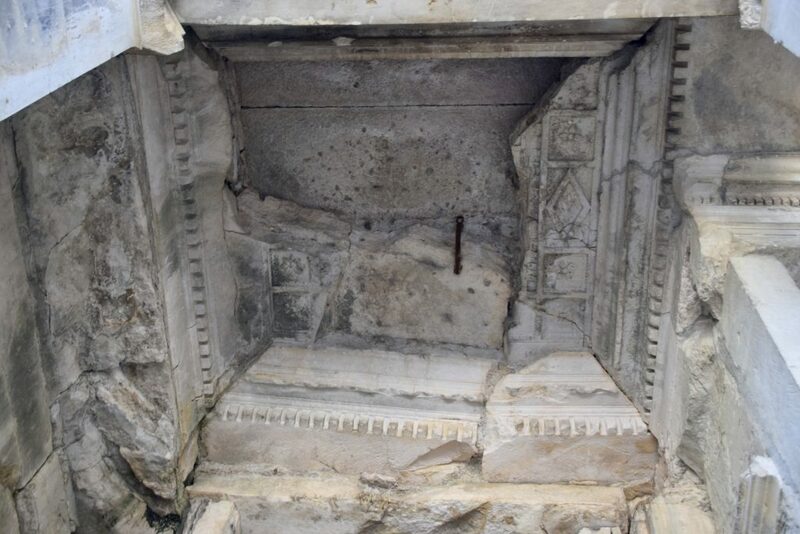 The truth is that there is considerable speculation as to its purpose, and it’s unlikely it was ever a temple and perhaps more likely that it was a library. In the end, it doesn’t matter, because it a very lovely place to wander for a while. 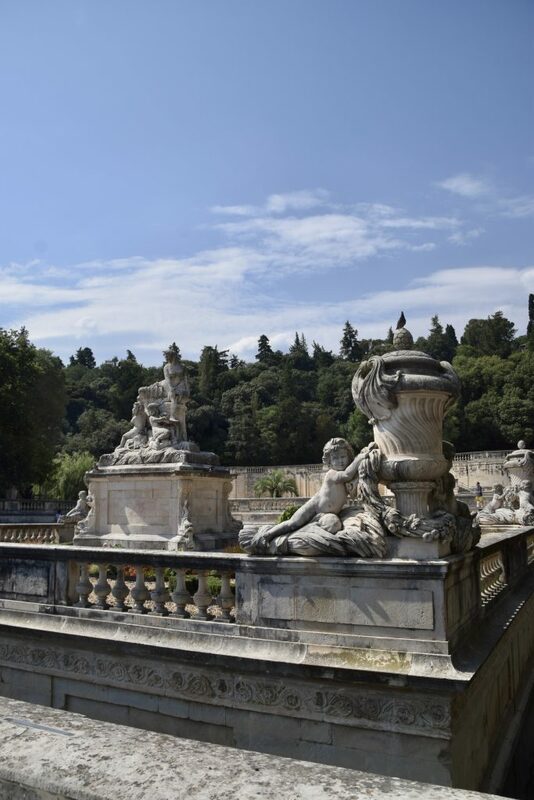 As a part of the building work undertaken during the reign of Augustus, 7km long ramparts were constructed. 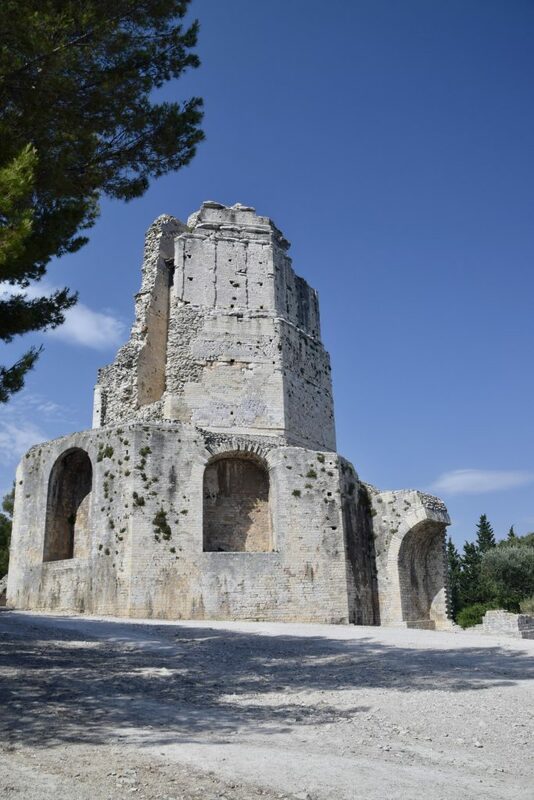 All that’s survived is the Gate of Augustus and the Tour Magne, which was built over a pre-existing 200 year old tower. And how do they know about this pre-existing tower? Because in 1601 a gardener called François Traucat dug up the tower. And why, you may ask, did he do this? 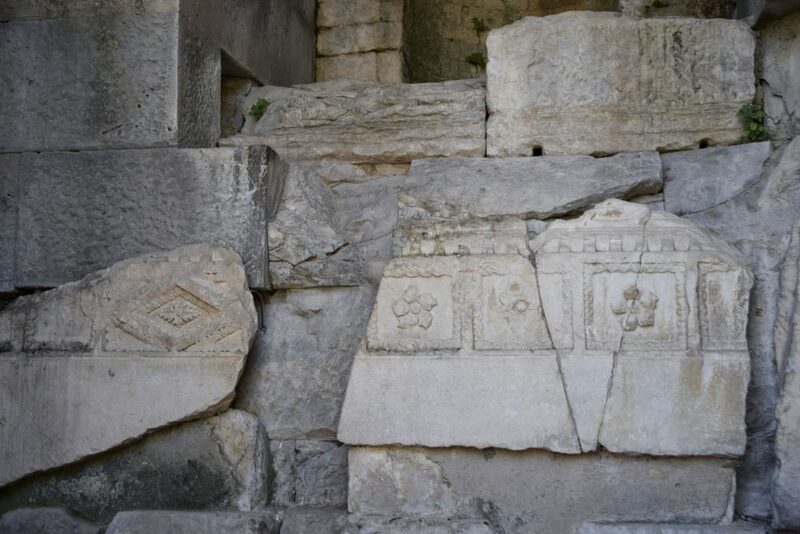 Because Nostradamus predicted that a Nîmes gardener would find treasure in the city. Traucat did not fulfil the prophesy. 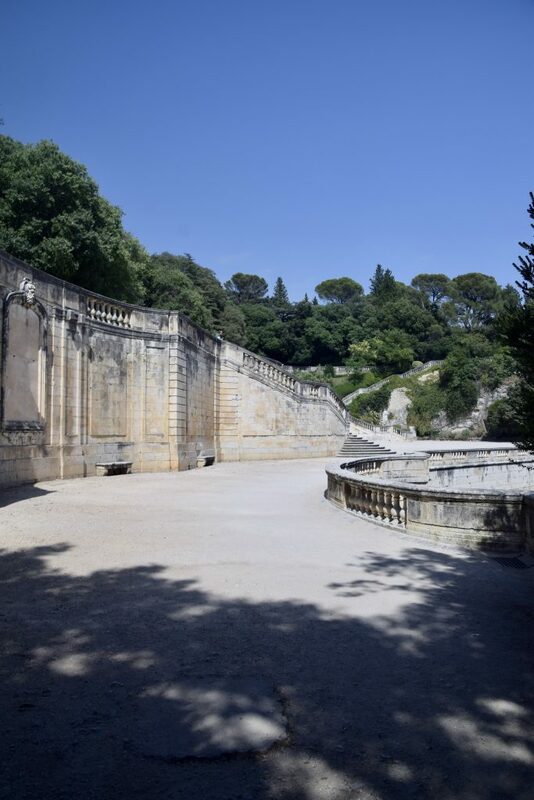 Anyway, we missed the Gate of Augustus, annoyingly, but we walked uphill from the Gardens of the Fountain – did I mention the heat? – and ended up at the tower ready to pass out. Thanks to a drinks machine inside the entrance, I got enough energy to climb determinedly to the top, but not with eagerness. And honestly that took a lot of willpower. I don’t like heights. I don’t like spiral staircases. I really don’t like spiral staircases which have low bars, and which are not wide enough for two people to pass each other with ease. By the time I got to the top, I just wanted to get the downward journey over with. Yeah, it’s lovely, but I really don’t recommend the climb to anyone who is not fit, not good with heights and has ever seen the film Vertigo. 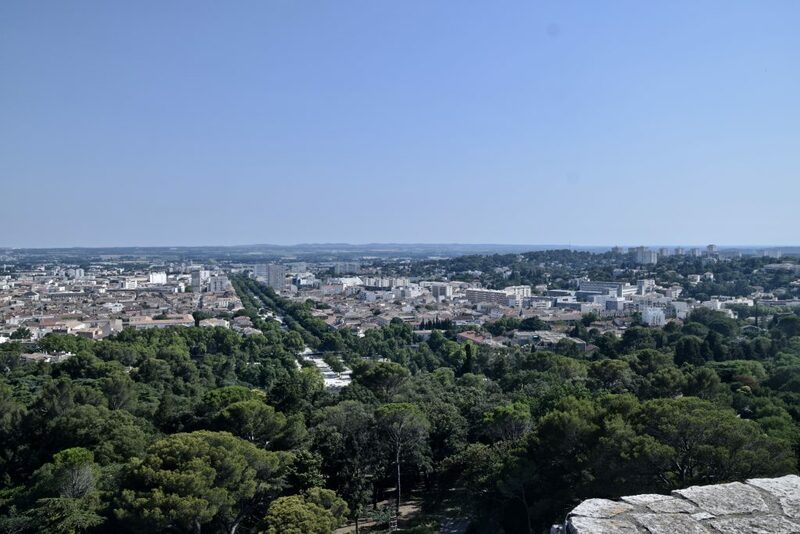 Nimes was one of my favourite places to visit during my French trip in the summer. 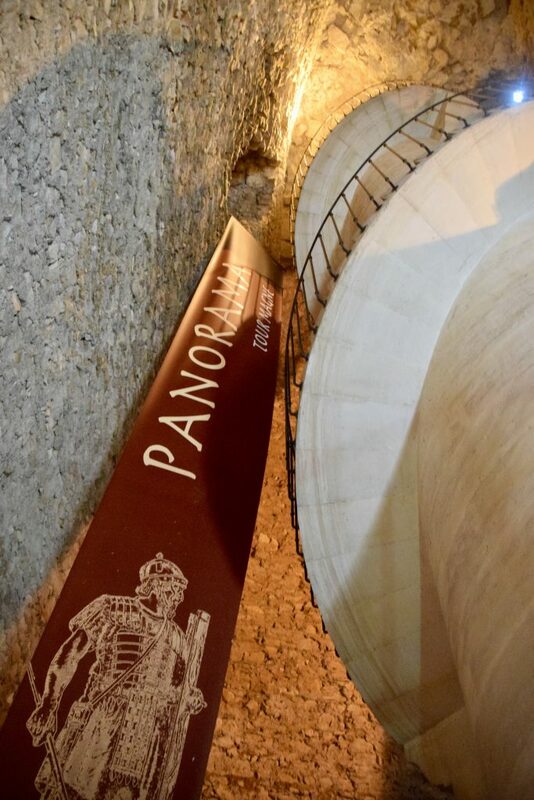 I had hoped to get to do some more things while we were in town, but the Musée de la Romanité was so good we stayed there longer than I’d estimated. Not that it was a problem – I’d definitely like to go back to the city. 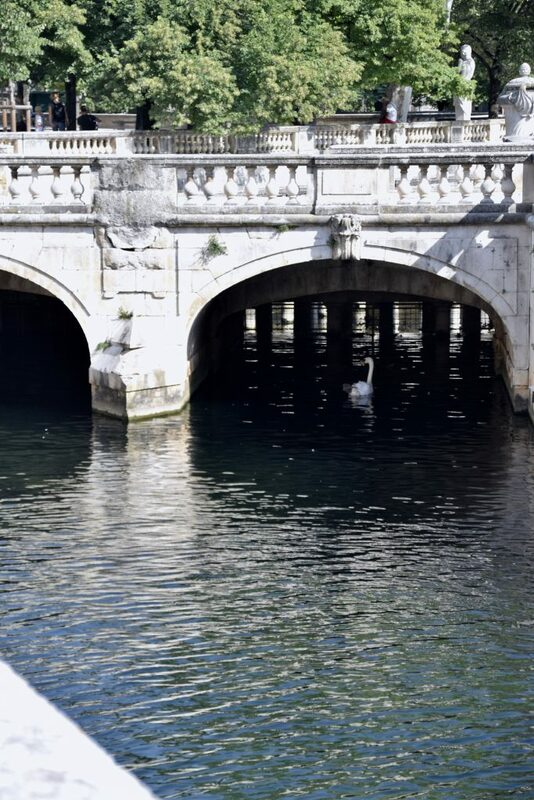 It’s walkable, it’s pretty and it has a laidback charm which encourages you to saunter around and immerse yourself in daydreams of ancient Rome and eighteenth century France. Once I got home, I discovered that, annoyingly, I’d missed the Gate of Augustus and the Castellum. Next time. There are also non-Roman things to do – they have a art museum, a city history museum and one on bullfighting, if that’s your thing. 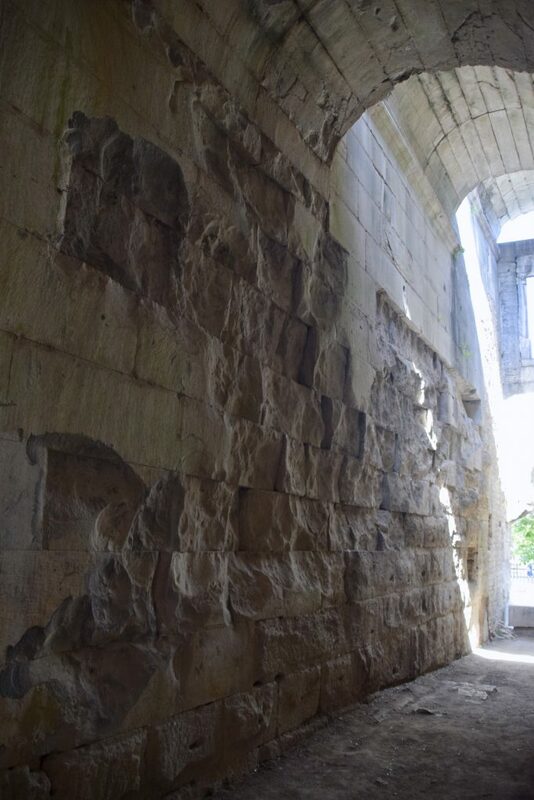 From Nîmes, you can get a bus to the Pont du Gard, the famous Roman aqueduct. I’m genuinely looking forward to my next visit and hope that it’s quite soon. However, if you get the internet on your phone, I found that the pretty handy SNCF app is actually the thing to consult.